CNN: You begin your book by writing about a store owner who vowed to close his store on Sundays, so his employees and their families, as well as his customers, could take the day off. But it didn’t stay that way for long. What happened? Sleeth: For almost 2,000 years, Western culture stopped — primarily on Sunday — for about 24 hours. Even when I was a child, you couldn’t buy gasoline, you couldn’t buy milk. The drugstores weren’t open. The only thing that was open was a hospital. Even in dairy farming country, we would milk cows, but we wouldn’t bring in hay. And so society just had a day where they put it in park. (That) was Sunday… until the last 30 years or so. CNN: Why do you think taking one day off a week is so important? Sleeth: We go 24/7 now, and I think it’s having health consequences. I think more and more, there’s a consensus that it leads to depression and anxiety. It’s interesting, when a doctor sits down and does a primary intake with a new patient, they ask about smoking, exercise and diet, but they don’t ask how much you’re working. They don’t get any sense of if you’re working seven days a week, or if you have time set aside — like people have always had — for rest. 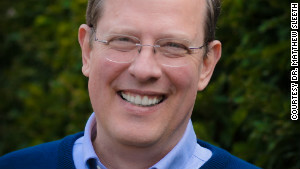 Dr. Matthew Sleeth is an author and former emergency room physician. I think the lack of rest is reflected in our saying, “We don’t have enough time.” I think it’s pretty much generally felt that we don’t have enough time to really get to the things we want to do in life. CNN: You write about incorporating a “stop day” into your weekly schedule. How do you think that can extend and enrich your life? Sleeth: A “stop day” is a day you really cease from your labors. This really comes in Western cultures from the Ten Commandments. The fourth commandment tells us to remember the Sabbath. The word “Sabbath” simply means “to cease” — to cease from your labors. Now, the definition of labor has changed over the centuries and the millennia. For some people, resting from their labors might mean resting from their sedentary job that they have, putting on tennis shoes and going for a run. For those who work physically, that would mean coming to rest. In the book “24/6,” I don’t try to define what rest is for a person, but I ask you to figure out what work is for you, and don’t do it one day out of the week.